Lauren first met Jason as her CrossFit coach so when Jason expanded beyond coaching fitness into the realm of nutrition, Lauren followed. Lauren was trying to do her best sticking to what she thought was paleo, but was struggling to keep it up. 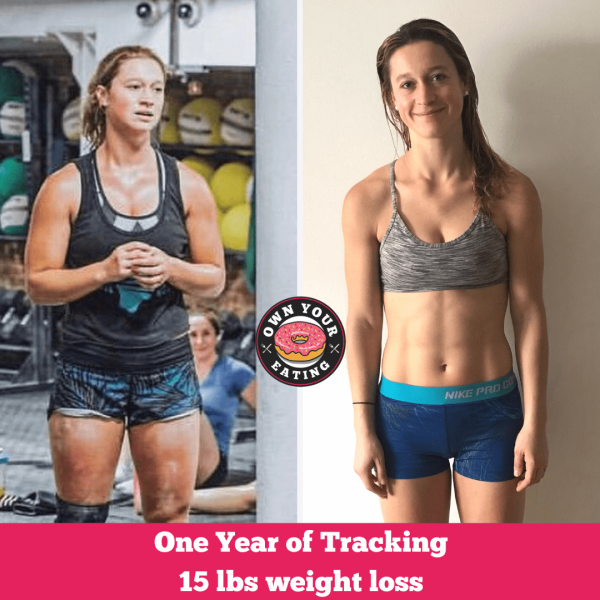 Find out how this chocolate chip cookie lover got started with Own Your Eating and how she feels about her own nutrition and the world of flexible eating! I got started with OYE with the Just Get Me Started Bundle to calculate my macros. I was familiar with MyFitnessPal (MFP) already, so once I found my macros, I started tracking right away. I had previously been eating ‘paleo’ with a few too many cheat meals that extended past a meal. I have a (large) sweet tooth so something that didn’t mean I had to cut out the foods I really enjoyed peeked my interest. Jason was also my first CF coach, so I had seen his results along with so many others and thought I’d try it out. About 15lbs. A large weight loss was not my goal, I wanted to find something that made me feel in control of my eating and this is it. Chocolate chip cookies have become a staple in my diet, but so have 800 grams of fruits and veggies. That was the balance I needed to find. In terms of the gym, my gymnastics movements in CrossFit are way better. And I am still hitting lifts in the gym that I could hit at 15lbs heavier. I think overall I feel like I have a good understanding of food and what my body needs, whereas before, although I understood paleo to be synonymous with health, I didn’t really have a deeper understanding of what that meant for me. Now I have so much more awareness of my nutrition. I know the “why” behind when I go over my macros — maybe I just really wanted more dessert and I need to learn to pump the break on that or I didn’t adequately account for how long my day was going to be at the office which meant a later dinner and more snacks. With that kind of awareness and “insider knowledge” I can set myself up for success and a much healthier relationship with food. My sweet tooth! I really love sweets and I always account for some chocolate each day but sometimes I nibble… a few nibbles can turn into a lot of macros! Then I realize I have gone way over what I accounted for. But on days where I do “blow it” I’ve learnt to wipe the slate clean and not get hung up on a bad day. Cookies, pizza, bread, pasta.. I wouldn’t deprive myself but I called it a cheat meal which usually meant eating way past full and then continuing the ‘cheat’ far past the ‘meal’. Don’t aim to be perfect, aim to do the best you can every day. I don’t hit my macros every day, I hit them 4-5 times a week, but I do my best every day. I tweak constantly and I try to be consistent because my goal is to make this sustainable and if you take the flexible out of flexible eating, to me, it is no longer sustainable. A year from now you will wish you had started today! Stop waiting for the “perfect” moment, because it doesn’t exist! The support and accountability of a coach is the game-changer element to getting on top of your nutrition. Check out our Lifestyle Memberships and begin your nutrition journey with confidence and the support you need to succeed.